SSC has released its notification for recruitment of Constables in Delhi police on Temporary basis on dated 9th September 2016 and decided date for the examination is 4th March 2017. In this article, we are providing you an analysis of medical standards for the recruitment. A candidate has to firstly appear in the Physical Standards Test/Physical Efficiency Test (PE&MT) and then after qualifying it, he will be eligible for taking computer based written Examination. Apart from the above requirement, following Physical endurance test is also to be qualified for Male/Female. • The minimum distant vision should be 6/12 of two eyes (without glasses) and shall be free from color blindness. • Knock knees, flat foot, varicose vein, loss or deformity of fingers & chest and joints, Halux valgus, halux rigidus, squint in eyes, bow legs and other deformity including loss of any part of body is not admissible. • The candidates should be of sound state of health, free from defect, deformity or disease likely to interfere with the efficient performance of the duties. No relaxation is allowed to any category of candidates on this count. • Those who qualify in the race event will be eligible to appear in the long jump and high jump events. • Three chances will be given to qualify in long jump and high jump events. • There shall be no appeal against disqualification in race, long jump & high jump, however, candidate may appeal against height and chest measurement on the same day of PE&MT before the Appellate Board. 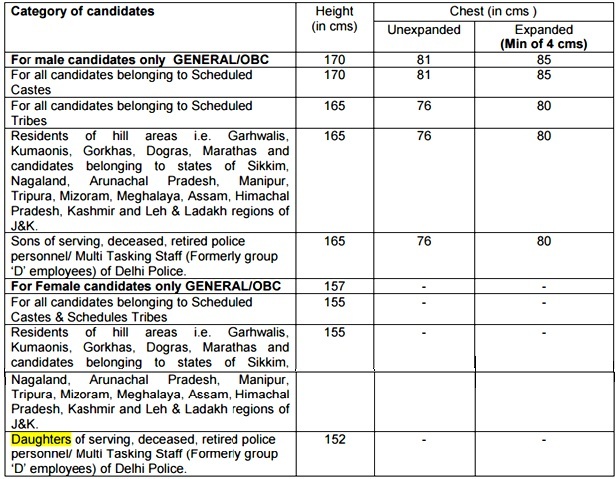 • There shall be no chest measurement for Female candidates. The candidature of female candidates who are pregnant at the time of PE&MT will be rejected as they cannot undergo the test. No appeal/representation will be entertained against such rejection. • Relaxation in height and chest (as the case may be) as mentioned above will be permissible only on production of certificate in the proforma as prescribed, from the competent authorities of the District where they ordinarily reside. • PE&MT Will NOT CARRY ANY MARKS BUT WILL BE OF QUALIFYING/ELIMINATION NATURE. • Use of drugs during Physical Endurance and Measurement test will lead to disqualification. We, at www.jagranjosh.com hope that the above information will be worthy in the respective context.